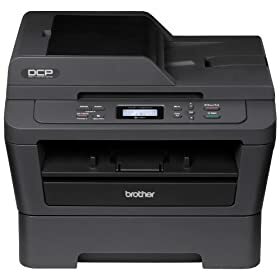 The DCP-7065DN is a laser multi-function copier with networking and automatic duplex ideal for small offices or home offices. It produces fast, high-quality monochrome laser printing and copying at up to 27ppm, as well as color scanning into one space-saving design. It also offers automatic duplex for producing for two-sided output and a built-in Ethernet interface for sharing with others on your network. The DCP-7065DN provides flexible paper handling via an adjustable, 250-sheet capacity tray and a manual by-pass slot for printing thicker media. A 35-page capacity automatic document feeder allows you to copy or scan multi-page documents quickly and easily. Additionally, it offers a high-yield 2, 600-page replacement toner cartridge to help lower operating costs.